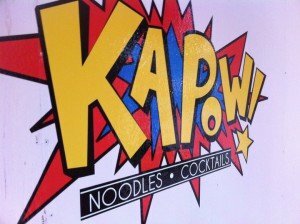 Like the restaurant’s colorful logo inspired by Japanese animation, everything about the new Boca Raton hotspot Kapow! leaps out and grabs your attention. Creativity is running amok at Kapow! in the cocktails and, especially, the food. It starts with the cutting-edge concept and design of the warm yet elegantly cool space in the trendy Mizner Park dining and shopping district near downtown Boca. This is to be expected considering the ownership dream team of restaurant/nightlife moguls Rodney Mayo and Scott Frielich (The Dubliner, Tryst, Dada, Howley’s, Longboards, et al.) plus eco-conscious trendsetter Vaughan Lazar (Pizza Fusion). But a cool concept is nothing without execution in the kitchen and behind the bar. Kapow! delivers on both counts, thanks in no small part to the fourth member of the ownership team, executive chef Roy Villacrusis – reigning two-time champion of the Grand Chef Throwdown at the Palm Beach Food & Wine Festival. Pooch poses with his handiwork at Kapow! Kapow! 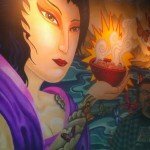 noodle bar launched with a VIP tasting on Nov. 22 and a public opening the following day. The menu features a blend of unique “Asiatic” cuisine with a French Vietnamese flair, leaning heavily on fresh, locally-sourced ingredients. 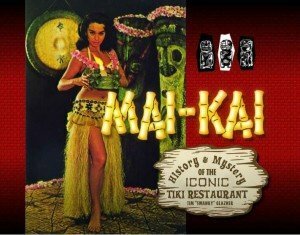 Add to this an eclectic selection of hand-crafted cocktails, and it’s a recipe for an exotic dining experience right up The Atomic Grog’s alley. My wife and I finally got a chance to visit last Sunday, joined by artist Mike “Pooch” Pucciarelli and “Mrs. Pooch.” The dominant feature of the intimate 1,600-square-foot room is the 9-by-28-foot mural made from a Pooch painting that hangs in the back of the restaurant. The Pucciarellis had attended the VIP tasting, but this was their first visit for a sit-down dinner. The entrance from the Mizner parking garage conveniently connects directly to the courtyard shared by Kapow! and The Dubliner. There are plenty of tables for diners from either restaurant, and the Kapow bar opens directly to courtyard customers. At first it seems like an odd mix (classic Irish pub and New York City influenced noodle bar), but like Epcot’s World Showcase, perhaps this is a great way to sample diverse cuisines and even mix them at the same table. A view of the dining room and open kitchen from the side of the bar. But we’ll save that melting pot experience for a later date. The first order of business was to experience Kapow! through the main entrance on the southbound side of Plaza Real, just south of Northeast Fifth Street. 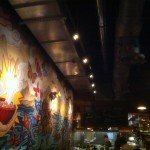 From the sidewalk, you see only a small sign hanging above the host/hostess stand, but much eye candy awaits when you enter the restaurant. 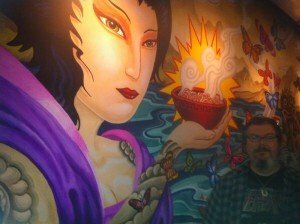 We were initially greeted by the massive anime-themed mural by Pooch, and on this occasion by Pooch himself. Kapow! 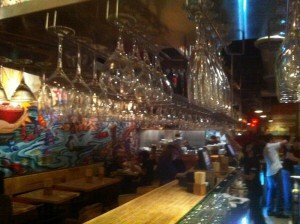 occupies a long and narrow space flanked by the mural on one long wall and an elaborate 25-foot bar on the other. 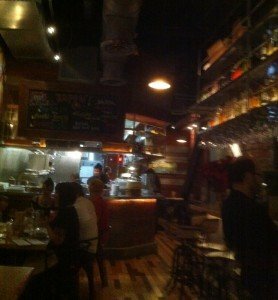 I love the bar’s overhead space for the liquor and glassware. The ceiling is very high, creating an illusion that the space is bigger than it really is. Reclaimed wood adorns the walls and floors, and the lighting is appropriately dim but not too cave-like. The music is non-intrusive yet enhances the cool vibe. Kudos to Mayo and company for another creatively designed room. A row of tables lines the mural wall, and other tables are scattered throughout the front and back areas. The bar would also be a fine place to dine and people-watch. You can check out the chefs at work in the open kitchen tucked into the back corner from just about anywhere in the room. During our visit, chef Villacrusis worked from a spot just inside the back of the dining room, supervising his staff and expediting orders. A view toward the back of the house and Kapow's open kitchen. The high ceilings make the small space seem much larger. We adjourned to a table with Mr. and Mrs. Pooch near the front door under the mural. It seemed to be a relatively mellow Sunday night with a dozen or so other guests, which pleased Pooch. “It was scary busy that night,” he said, referring to the grand opening. Tonight we’d have an unencumbered opportunity to explore the menu. He seemed pleased with the mural, which was flawlessly enlarged from a 20-by-60-inch canvas. His only nitpick: The fire alarm and safety lights in the middle of the wall. Perhaps he should have included these obstructions in the scene! The menu is divided into small plates, noodles, big plates and steamed buns. Our helpful and knowledgeable server, Jerome, introduced us to the cuisine and explained the concept behind sharing small plates. Just be aware that some plates are more appropriate for sharing than others, and you’ll need to gauge your party’s tastes since many dishes, such as pork belly and beef tongue, may not please all palates. On his previous visit, Pooch sampled the Grilled Beef Tongue small plate (with Japanese mustard and momiji croshi) and gives it a hearty thumbs up. On this visit, we shared the Crisp Fried Pork Belly (with lechon sauce, cabbage and achara). It was melt-in-your-mouth delicious, milder in flavor than I expected but with the sauce adding the necessary boost. The Spicy Lover cucumber margarita. The Pooches shared another favorite from their initial visit, the Florida Rock Shrimp Tempura (with yuzu spiced mayo and wasabi sprouts). It was gone before I could grab a bite, so I’ll assume it was to their liking. They also wisely went back to the Sweet Potato Fries, and I was fortunate enough to sample a few. Fresh, hot and crispy with not a hint of sogginess, these were among the best sweet potato fries I’ve had the pleasure of tasting. Mrs. Hayward had the light and healthy Seasonal Pickles (house pickled beets, carrots and daikon), but unfortunately they were absolutely drowned in vinegar. Pooch and I shared an order of Creamed Cauliflower, which was heavily laced with an earthy truffle oil. A dozen or so florets topped the generous pile of rich mashed veggie. 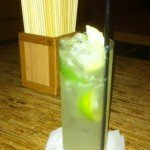 From the cocktail menu, I started off with the Yuzu Caipirinha (Leblon Cachaça, lime juice and yuzu syrup). Like a sophisticated and perfectly balanced rum drink, this lived up to my expectations. Pooch was so impressed he ordered one for his second drink after starting off with the Kiwi Caipiroska (Tito’s vodka, Rock Sake, kiwi slices, lime and simple syrup), which was rated a bit too sour by our group. The cocktails were obviously made with care and were beautifully presented. The only flaw was the timing of service, with some at our table having to wait much longer than others for their drinks. 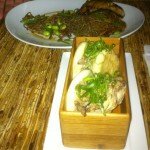 The Crispy Duck Confit steamed buns and Chilled Soba (noodles with broiled black cod) at Kapow! in Boca Raton. 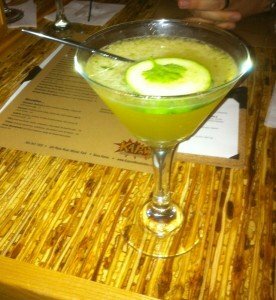 One of the cocktail highlights was the Spicy Lover (Partida Reposado tequila, English cucumber, green tobasco, cilantro, organic agave nectar and lime juice). It was inventive, complex and packed with flavor. My wife is a big fan of cucumber margaritas, and she savored this one to the last drop. Mrs. Pooch kept her drinks a little more simple with the old standby Yellow Tail Moscato. Many wines and sakes are available for non-cocktailians. On our next round of food, steamed buns were calling. My choice, the Crispy Duck Confit (with dried cherry and creamed goat cheese), was decadent and delicious, the goat cheese adding a familiar layer of flavor to the fatty duck. The puffy buns were a little doughy but the presentation (a cute box that also served to keep the buns warm) was top-notch. The wives both ordered Bolgogi Buns off the specials board, a tasty beef with a sweet and spicy Korean barbecue sauce. Another one of the evening’s highlights. Having been a bit disappointed with a ramen bowl on his previous visit, Pooch gave the noodles another try but this time opted for the Chilled Soba (with broiled black cod, asparagus and edamame). He was not disappointed. The delicate and flaky cod was perfectly prepared and the noodles were flavorful. The deep-fried cheesecake (front) and eggnog crème brûlée with minty chocolate drink. 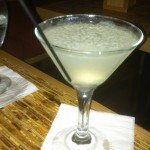 My second cocktail was the Kapow Lychee Martini (Nolet’s gin, lychee and St. Germain Elderflower liqueur). I’m a fan of St. Germain, and the fresh lychee was a great touch. But this came off as too simple for my taste. If you’re a gin-drinker, you’ll probably be happy with this or the Shiso Cucumber Martini (Hendrick’s gin, shiso, organic cucumber and lemon). Luckily, we still had an appetite when Jerome returned for our dessert order. 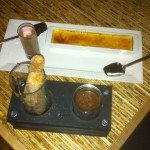 Two items immediately caught our interest: The deep-fried cheesecake and eggnog crème brûlée. So we ordered two of each for the table. The elegant presentation brought the immediate “wow factor” and the cheesecake went above and beyond our expectations. It was incredibly addictive. The “cake” was actually a creamy banana-infused mixture, deep fried in an egg roll shell and dusted with what I wouldn’t doubt was organic sugar. And the apple dipping sauce just put it over the top. This set the bar so high, the crème brûlée just couldn’t compare. The crust was good, perfectly torched to a thin, crispy layer. But the custard didn’t pass muster with our group. Most of us felt it was too congealed and lacked the creamy quality of a classic crème brûlée. 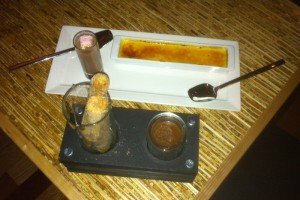 The crème brûlée also came paired with a chocolate drink containing marshmallow and mint. This was very festive and added another holiday flavor punch, but it didn’t really elevate the dish. 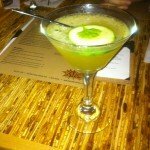 The Ginger Mojito featuring Thai rum, fresh mint, ginger-infused simple syrup and ginger candy garnish. My last cocktail was an afterthought but it turned out to be the best. I’ve had many, many mojitos and they’re usually a disappointment. Not so at Kapow! 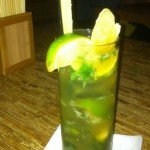 The Ginger Mojito (Thai rum, fresh mint, ginger-infused simple syrup) was a flavor explosion with lots of mint, an exotic rum and more than a hint of ginger. And the intensely sweet ginger candy was a great edible garnish and fitting end of the evening. As the owner of an extensive rum collection, I’m embarrassed that this was my first taste of Mekhong, Thailand’s national spirit. I’ll definitely be seeking it out. It’s a distinctive rum, and my research reveals why. According to an article in Imbibe magazine, Mekhong’s signature taste is derived from rice distillate that adds a sake-like backbone, plus native Thai herbs and spices that enhance the light (70 proof) spirit’s already complex mix of toffee, citrus, nuts and vanilla. In summary, it’s the perfect spirit for an Asian mojito. 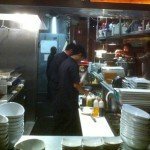 The National Restaurant Association recently released its top 20 trends for 2012 based on a survey of professional chefs who are members of the American Culinary Federation. Kapow! is right on track with four of the top five: Locally sourced meats and seafood, locally grown produce, hyper-local sourcing (such as restaurant gardens), and sustainability. It only lacks healthy kids meals (to our relief). The Atomic Grog typically isn’t a fan of things new or trendy. Our reason for being is the celebration of all things retro and classic. But every so often a new venture rises above the mundane and predictable to put its own original stamp on the South Florida restaurant and nightclub scene. Kapow! is one such venue, and it does so with its finger on the pulse of the chef-driven food scene that one can’t help but embrace. Postscript: Villacrusis left Kapow! 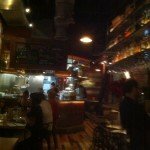 in early 2012, but by all indications the food and menu are still creative and inspired. We hope to make a return visit soon to taste the creations of new executive chef Anna Feinberg. Kapow! 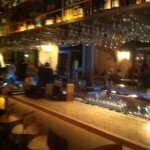 is at 431 Plaza Real in Boca Raton’s Mizner Park, adjacent to The Dubliner. 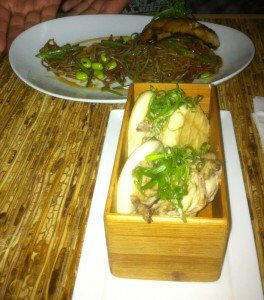 Call (561) 347-7322 or e-mail info@KapowNoodleBar.com. A 9-by-28-foot mural of a painting by Mike “Pooch” Pucciarelli spans one entire wall at Kapow! in Boca Raton. 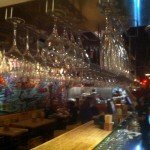 To save space, the glassware and liquor bottles are stored above the bar at Kapow! in Boca Raton. A view toward the back of the house and Kapow’s open kitchen. The high ceilings make the small space seem much larger. Executive chef Roy Villacrusis (far right) works with his kitchen staff at Kapow! in Boca Raton. 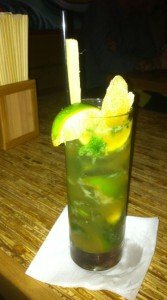 The Yuzu Caipirinha at Kapow! 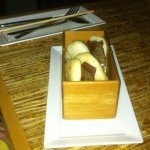 Kapow’s Bolgogi Buns are served in a distinctive wooden box. 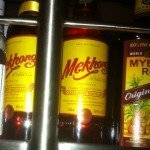 Mekhong rum is Thailand’s national spirit. 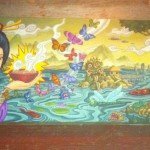 Pooch’s original painting that was enlarged for Kapow’s mural hangs on a back wall. 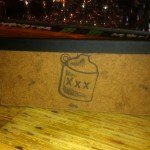 This entry was posted in Cocktails, Food, Photo galleries, Restaurants, Reviews, Rum and tagged Boca Raton, Kapow!, Mike Pucciarelli, Pooch, Roy Villacrusis, South Florida. Bookmark the permalink.